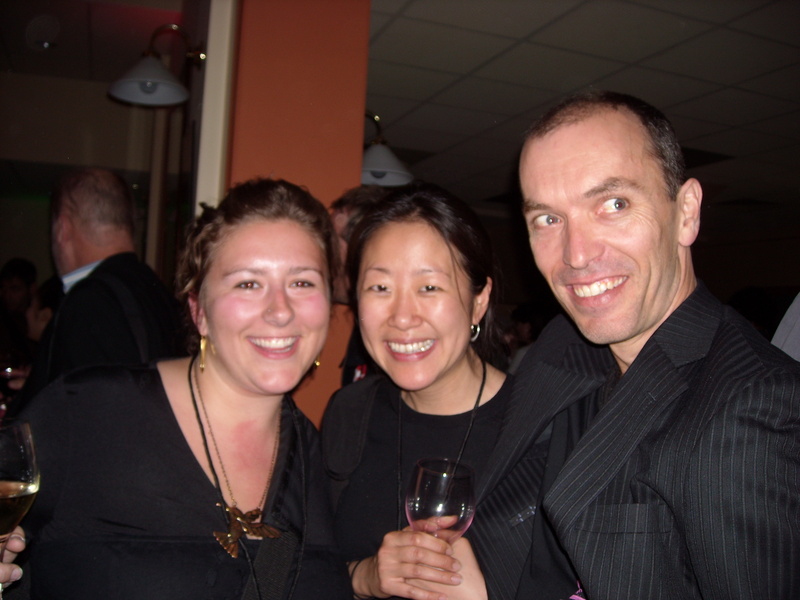 Joohee Park and Xanthia Walker journeyed to Adelaide Australia on a mission: to assist the ASSITEJ 2008 World Congress and Festival organizers in all ways possible as the United States ‘terns. On our quest for intern excellence, we experienced the congress and festival from start to finish, from spreadsheet to closing dance party. We are grateful for the opportunity to experience the Congress and Festival so intimately, and wanted to share back our experiences with the TYA-USA community. X: At the time of my application, I was a first year TFY MFA student at Arizona State University, and was reading international TYA work for the first time. I was floored by the plays and articles I was reading, and thought that the opportunity to learn more about international TYA firsthand was too great to pass up. Preparing for the congress and festival for me meant three things: 1. Brushing up on my Spanish language skills, 2. Getting my passport renewed, and 3. Gaining a deeper knowledge of the history and current practices of ASSITEJ. J: I first heard about the internship at the 2007 AATE conference in Vancouver. As a Ph.D student in Theatre for Youth, I thought this could be a great opportunity to experience a broader world of TYA. Once it was confirmed that I would be one of the interns, I tried to learn as much as possible on ASSITEJ and its work. X: We arrived in Adelaide a little more than one week before the congress and festival began. We spent our first week assisting Emma Zacaravicious, the Hosting Coordinator for Young People and the Arts Australia. When we arrived at Carclew for our first day on the job, we immediately began working and I was relieved about the ease with which we transitioned into the office community. Emma (hosting coordinator), Lenine (incoming director of YPAA) and Mimi (acting director of YPAA) were such wonderful bosses. We spend a large amount of pre-conference time organizing—volunteers, schedules, stuffing packets of information for delegates, arranging a complex web of language assistance—I made more spreadsheets during this week than I ever have in my life! This week was definitely hectic. I think that there was a lot of goofy chaos that occurred due to the massive nature of the event, and the fact that several different organizations were working together to organize the congress and festival. J: I definitely agree with you that tension between different organizations was the main reason for whatever problems that occurred. Power struggles and sometimes simple miscommunication made our jobs hard sometimes! I also think that perhaps the Australians did a bit too much to make the delegates feel welcome… I heard that one of the main complaints about the Montreal Congress was that there was very little hosting, and thus the Australians tried to overcompensate for that. But perhaps as the greatest beneficiary of South Australian hospitality I cannot complain! Speaking of South Australian hospitality, it would be a crime to talk about our ASSITEJ experience without Marjorie Fitz-Gerald. She did not participate directly in the festival, but she was a HUGE inspiration to me and many others. For those who do not know Marjorie, allow me to introduce her very, very briefly. Marjorie was our host– Xanthia and I stayed at her house for three-plus weeks. Thirty-something years ago, the mother of five wondered why South Australia did not have a youth performing arts group. “Well, I should start one,” she thought. As the housewife did not have much money, she came up with an idea to start a cake drive. She visited sugar factories, flour factories, dairies and egg farms and asked for donations. Then she went on local television through a friend of hers and asked mothers all around Adelaide to take part in her fund-raiser – she will provide all the ingredients, they need only to bake the cakes and bring them back to her. In the next few weeks, hundreds of women baked about five-thousand cakes, which became the founding funds for Carclew, the YouthArtsCenter in Adelaide. As for the historic space in which Carclew is located, it was “given” to Marjorie by the prime minister of SA when he called a meeting about Marjorie’s idea and ten-thousand supporters showed up. Marjorie still serves on many, many scholarship and fund-raising committees. Every other year she makes two-hundred jars of marmalade to serve at a scholarship brunch! When I asked “Is there anything you can’t do?” she said “no” without missing a beat. X: YES! I wholeheartedly believe that there is nothing Marjorie can’t do. I would argue that her work as a patron of the arts in Adelaide is a primary reason why there is such a large force of TYA and TFY in Adelaide. I don’t think we could have dreamed of a better host during our stay. I think that we should also mention the rockin’ organizing skills of Mr. Tony Mack at this time—Tony Mack did a fantastic job of not only making us feel welcome in Adelaide, but giving us jobs that were consistently relevant to our language skills and also quite fun. For example, I found myself translating emails back and forth with ASSITEJ Spain and Joohee, I know you had many a conversation with the local Korean community. X: There were HUGE numbers of delegates from the United States, Korea, and Australia. There were many different kinds of practitioners of the field present as well. I met playwrights, directors, actors, artistic directors, managing directors, designers, administrators, scholars, practitioners of community-arts, and graduate students in our field from all corners of the globe. The large number of young professionals present made our field feel very accessible to me as a young artist/scholar. I found myself throughout this experience with a recurring question regarding representation: How do we have an international congress and festival with true international representation? What are the social, political, and cultural forces that serve as access points and barriers to achieving this? I wondered about parts of the structured diversity of the congress, such as the Asia/Pacific forum—it was the only forum that had specific regions attached to it, and I wondered if this was because we were in that part of the world? Additionally, I had with a strong desire to see more work that was not in English. I understand that English is one of the working languages of ASSITEJ, and that we were in an English speaking country, however one of the truly exciting things about this congress for me was the opportunity to experience theatre that was NOT in English. J: This congress and festival really made me think about how the field is not free from politics and economics. For example, the French speaking countries were not present at all. As a beginner in the field, I do not know of the politics behind that. But I do know that it is sad that a big group of countries refuse to be part of a wonderful festival of arts because of power issues. Also, many of the economically challenged countries were under represented at the congress. I know that this was an issue that was brought up at the Congress. Some people thought that ASSITEJ International should expand funds in order to bring forward a more diverse representation. Although this is not an issue that we can solve in a short period of time, I think it is worth pondering. Part of the reason why we had such a large number of Americans, Koreans, and Japanese was precisely because delegates from those countries have relatively better funding situations than delegates from other countries. About language issues, we need to consider the fact that the festival was hosted in an English speaking country. Yes, many of the shows were in English, but many of the shows were also physical and non-verbal theatre. We will see how different it is three years later, when the festival is held at non-English speaking countries (Denmark and Sweden). On the other hand, I had some problems with language and representation at the first ITYARN (International Theatre for Young Audiences Research Network) conference, which was a part of the forums. A majority of presenters at the panel in which I participated were Americans, and thus the discourse at that panel became mostly about TYA in the US. Non- Americans felt left out – in terms of topic and language, as many did not speak English fluently. I believe this problem has already been addressed by many participants. Did your experience at ITYARN differ from mine, Xanthia? X: I agree with your analysis of ITYARN—the panel I attended was very United States focused. I think that the panel missed some opportunities for rich internationally focused discussion. X: At the festival, I feel that I was an audience member of some radical TYA work that was deeply exciting to me. Many of the shows challenged me, broke social, political and cultural boundaries, and treated youth like they were capable of responsibly handling difficult content. Due to the large representation of Australian shows, I was able to see a cross-section of Australian work being made for and with youth in Australia, and I must say that I was impressed! X: The forums barely scratched the surface of my itch to dialogue with international experts in our field. All of the forums I attended sparked me to think critically about our field in one way or another. But I wanted more. One forum was called “IS Theatre a Tool for Social Change?” Within the first ten minutes of the forum, it was clear that the delegates present in the room agreed that theatre was indeed a tool for social change. I really wanted us to get to the next step of that conversation—the how, the why, the when, and the where. My two favorite forums were the Next Generation Forum and the Festival Forums hosted by Artistic Director Jason Cross with various presenting theatre companies as guests. J: I agree with you that many of the forums were so caught up in letting everyone have a say that the discourse itself was not deep enough. I did feel that in certain forums the moderator did a better job in bringing the questions and comments back to generate a more meaningful conversation. For example, at the “Theatre for Cultural Diversity” forum, Kim Peter Kovac did an excellent job of summarizing comments and moving on to the next issue. J: My favorite shows were Headlock and The Bridge. I loved how they both dealt with “challenging” issues such as jail and war, and how both overcame language barriers – in different ways. I am opposed to “protecting” youth from dark issues such as violence or war, and these plays addressed the topic in a highly artistic but realistic way. The shows proved that artists should not “dumb down” difficult content but challenge youth to think deeper and harder. X: We are definitely in that the shows at the Festival did not shy away from taking on important themes. I am tied for favorite show between Headlock and Hoods. I thought both shows took on challenging issues that real kids deal with and presented them in an honest and thoughtful ways with a great deal of artistic integrity. These shows go back to what we’ve both said earlier about respecting the mental capacity/integrity of an audience of youth enough to share “difficult” stories with them. X: I had many favorite moments—I loved the constant conversations I overheard happening in all corners of the Festival Centre; I loved seeing swarms of young people piling out of a show and plopping down in the outdoor plaza to eat bag lunches; I loved the playwright slams and the wine drinking at Swish bar. The international dance parties that happened at the Asian party and the closing night party were SO FUN, and were really in the spirit of global community gathering. I most loved seeing the shows—I felt re-inspired by the work I saw. J: Oh gosh, that Asian party really did rock, didn’t it? And we sure did drink lots and lots of wine! (Often times free!) I really can’t pinpoint my favorite moment, but I can name a few – I was stunned by Susan Osten’s Baby Drama talk. It shocked me in an inspiring way, how infants and toddlers need an emotional connection with their caregivers in order to survive. The “global bonding” was amazing – even though we did not speak the same language, everyone had one thing in common – that we cared about youth arts. When I first met Tony Mack and Jason Cross, the two directors of the festival, I was stunned at how easy-going and unpretentious they were. Despite their high-up positions, neither of them displayed any sense of self-importance. That helped our jobs a lot, I think. *Gripes: Was There Anything Missing? J: Hmmm… I’m not sure about this one. I am going to say that it was great as it was. I really can’t think of something that I was expecting/eagerly awaiting but did not see. X: Yes- it really was an amazing overall experience. I do have one gripe though: I really really really wanted post show conversations/dialogues/forums/something! It could have been a valuable experience to have a structured space to respond to the work we were seeing. I don’t mean respond to the lights or costumes, or to tell the artists how we think their show should be re-staged, but to engage with the message of the piece, and to what the piece may mean as a contribution to our field. I wanted that space for critical thinking. J: Yes, I know you wanted post-show conversations. But I personally do not see how that could have been possible in a festival setting. Audience members generally do not know each other, and often times students were bused into the theatre. Of course I agree discussing critical thoughts can generate more critical thoughts and eventually lead to better art and better life, but in that setting, that just is not appropriate. That is why those daily drinks at the Swish club (as horrible as that bar was) were so important – we got our chances to reflect and criticize. X: I agree that it might not have been possible for the conversation to take place in the theatre immediately after a show, but what about creating a post-show dialogue room? That way, if a group of people wanted to get together to discuss, say, The Girl Who Cried Wolf, there would be a structured space to do that with people one might not get a chance to converse with otherwise. I think it could be a way to add depth to the conversations that were happening already in the hallways and at the Swish bar. X: I am incredibly grateful for this experience and to TYA/USA for making it possible for me to be in Adelaide. I am excited to continue to be a part of Theatre for Young Audiences on an international scale. I also am grateful in that the experience afforded me the opportunity to meet and listen to not only the major figures in our field, but also the young people—the emerging artists and the graduate students who are just getting started. I feel inspired about the future of our field and about the next World Congress and Festival in Coppenhagen/Malmoe! J: The internship was an experience of a lifetime. It allowed for a weary graduate student to regain faith in what she does. I came back from Adelaide with a new perspective on not only theatre but also life: that in order to change things, I must act. And there are other people out there who share my belief, even though I often feel alone. Art is beautiful in itself, and also because it gives us so much power. Xanthia Walker and Johee Park with festival artistic director Jason Cross. Xanthia Angel Walker is a director, facilitator, and educator passionate about the intersections of theatre and community. She holds a MFA in Theatre for Youth from Arizona State University and a BA in Theatre and a BA in Gender, Women, and Sexuality Studies from University of Minnesota. Xanthia is the co-founding artistic director of Rising Youth Theatre, which creates and produces new plays through partnerships between youth, communities, and professional artists; and was awarded the inaugural Mayor’s Arts Award in Theatre by Mayor Greg Stanton in December of 2012. Her most recent directing credits include Woman and Girl by Charlie Steak at Space 55, La Tierra de mi Alma in Teatro Bravo’s 2012 new Latino play series, Finding Family: Three Short Plays About Immigration at Rising Youth Theatre, Community at Free Arts of Arizona, and Venus in Stitches by Lou Clark at Rising Youth Theatre. She has worked as artist in residence at the Tumbleweed Center for Youth Development, the Arizona Department of Juvenile Corrections, El Nido Family Centers; and as a teaching artist with Childsplay, Phoenix Theatre, and Free Arts of Arizona. Xanthia is the current Theatre Arts Department Chair at Arizona School for the Arts. She has taught courses in community-engaged theatre and theatre for social change at Arizona State University and creative collaboration, a course about the development of new work at the University of Minnesota. Xanthia is a recipient of the 2008 ASSITEJ World Congress and Festival Internship, the 2010 Ann Shaw Fellowship and is the 2009 Winifred Ward Scholar, awarded for excellence in the field of Theatre for Young Audiences. She completed a yearlong internship with Cornerstone Theater Company in Los Angeles in 2009-2010. Her article Pronouns, Playbuilding, and the Principal: Negotiating Multiple Sites of Activism in a Youth-Focused Theatre for Social Justice Project is featured in the anthology Staging Social Justice: Collaborating to Create Activist Theatre, published by Southern Illinois University Press in June 2013. Xanthia’s manifesto, titled For the Future of Theatre for Young Audiences is published in the Fall 2012 issue of TYA Today. She is the co-editor of the online publication Incite-Insight for the American Alliance for Theatre and Education. Great post, ladies. Thanks for sharing. I read it eagerly as I couldn’t attend the festival and was looking for some insight. I’d like to comment on Johee’s response to Xanthia’s gripe. I’m having a hard time with the sentiment that the setting was not appropriate for critical discussion. Personally, I can’t think of a better setting. Where are you ever going to find the ideal audience for a difficult discussion. That is to say, whenever a difficult subject is broached and you give the opportunity for personal expression, you are always going to have a multitude of opinions despite how well people may know each other. Whether they are kids bussed in from various places or whatever. As a TYA artistic director in the States, we bus in students from all over the region and follow every performance with a critical discussion. Granted, it is guided heavily by a moderator in an effort to get under the surface of the play quickly (most school audiences don’t have a lot of time). We actually pose an inquiry question at the top of the show, asking the audience to keep something in the back of their mind as they watch. It is usually thematic in nature, allowing us a broad range of follow up questions (i.e. heroism, disguise, inheritance, survival, home). We bank on every audience being curious about the actors’ personal lives, the use of weapons or whether a staged kiss was “real” or not. And we make time for those questions, too. But we begin by guiding a conversation to get under the surface of the play. I’ll confess that, as a producer, my objective is to build a community. And I want to make room in that community for everyone. But building a community means that there are going to be some challenges, not the least of which is balancing multiple perspectives. If I’m going to empower young people to become change agents for the future, I want to give them a space where they can reflect and be encouraged to share. Especially in front of strangers. I’m not suggesting taking on a confrontational attitude. But I am saying that young people need opportunities to stand up and say what they feel in a safe environment. It becomes an exercise in autonomy and identity. Self-determination. Something that I’d like to suggest is at the heart of what we, in the field internationally, are all about. So what better place, then, for a critical discussion. Anyway, thanks again for sharing and congratulations on your fabulous experience.